The chief executive of one of Germany's leading space companies has lost his job because of the Wikileaks saga. OHB-System's Berry Smutny was reported in a cable to have told US diplomats that Europe's Galileo satellite-navigation project was a "stupid idea". 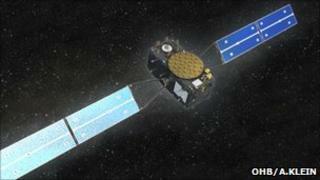 Bremen-based OHB-System is part of the consortium that will build Galileo's first 14 operational spacecraft. Although Mr Smutny has denied the cable's contents, OHB's board has decided to remove him from his post. A company spokesman told BBC News that Mr Smutny had left OHB-System with immediate effect. A statement from OHB-System on Monday said its supervisory board had "passed a unanimous resolution to revoke Mr Smutny's appointment", adding that it "disapproves these conversations and the quotes attributed to Mr Smutny". Berry Smutny was alleged to have told diplomats at a meeting in Berlin in October 2009 that Galileo, a flagship space programme of the EU, was a waste of taxpayers' money. The cable, which was published by the Norwegian daily Aftenposten last Thursday, quoted the OHB-System chief as saying, "I think Galileo is a stupid idea that primarily serves French interests", and, in particular, French military interests. Mr Smutny was further reported to say that Galileo was "doomed for failure" or would "have to undergo drastic scalebacks for survival". When approached by Aftenposten to comment on the cable, the executive conceded he had met US officials but rejected the notion that he had made any such remarks, adding that he was a supporter of Europe's proposed sat-nav system. Galileo is a multi-billion-euro venture which will complement - but also compete with - the US Global Positioning System (GPS), providing very accurate timing and location data that can be used in a host of applications from landing planes to co-ordinating financial transactions. The endeavour is controversial because its deployment is long overdue and significantly over-budget. OHB-System and UK-based company Surrey Satellite Technology Limited (SSTL) were awarded a contract valued at 566m euros (£465m) in January 2010 to start the production of the Galileo constellation. Surrey will assemble the electronic payload for each satellite in Guildford before shipping it to Germany to be incorporated in the spacecraft bus, or chassis, prepared by OHB. The consortium's contract win was a spectacular achievement for the two firms which beat off the combined bid of Europe's two biggest satellite manufacturers, EADS Astrium and Thales Alenia Space (TAS). OHB-System then followed this triumph by winning the other high-profile European satellite-manufacturing deal of 2010 - the 1.3bn-euro contract to produce the next generation of weather satellites for the continent. In this case, the contract is shared with TAS. The statement from the OHB-System supervisory board said Mr Smutny had to be removed from his position in order to avert any further damage to the company on the part of customers, political representatives and the public at large. It thanked the outgoing chief for the work that he had performed over the past 18 months, "particularly stressing the fact that last year had been the most successful in the company's history". Marco Fuchs, who is currently the CEO of the parent company OHB Technology, will be assuming the position of CEO of OHB-System.